Throughout January of this year, the Russian navy has been running drills in the Mediterranean Sea, and not just with one or two fleets, as before. This time, all four fleets are out at once: the Northern, Baltic, Black Sea, and Pacific. Even before the New Year, it was known that Russian ships from Severomorsk, Baltiisk, Sevastopol, and Vladivostok were bound for the Eastern Mediterranean. Citing an unnamed source in the general staff of the country’s armed forces, Russia's information agencies reported that the vessels were set to rendezvous off the coast of Syria for "joint combat missions." In addition, the warships — the missile cruiser Moskva, the large anti-submarine ships Marshal Shaposhnikov and Severomorsk, the patrol boats Yaroslav Mudriy and Smetliviy, six large landing craft (the Kaliningrad, Novocherkassk, Alexandr Shabalin, Saratov, Nikolai Filchenkov, Azov), and other support vessels — were scheduled to make repeated docks at the Russian navy's logistics point at the port of Tartus to allow the crews to rest and resupply with water, fuel, oil, and lubricants. It is not ruled out that, if necessary, the ships will be used to evacuate Russian citizens who wish to leave their adopted homeland in Syria. A statement to that effect was made by the Russian Foreign Ministry. According to the unnamed source, it later transpired that the interfleet combined force of the Russian navy would not only establish command and control over the large detachment of Russian ships (16 vessels) and conduct joint maneuvers at sea (which the Chief of Naval Staff has not done in a long time). The interfleet force would also play out tactical scenarios in late January, to simulate the landing of several navy divisions, military equipment and amphibious assault units of the 108th Kuban Cossack Regiment from the Novorossiysk Air Assault (Mountain) Division on the Syrian coast. Thereafter, the reverse process of loading vehicles and divisions on board landing ships is to be drilled. 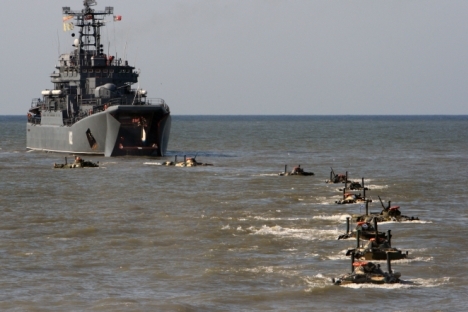 Cover fire during the landing operation (blanks, not live ammunition) will be provided from the sea by the abovementioned Moskva, Severomorsk, Smetliviy, and Yaroslav Mudriy ships. The real objective is not to demonstrate the growing power of the Russian navy or square up to other naval powers (the U.S., for example, has just one fleet in the region, but its combat strength is comparable to Russia's four fleets combined: one or two carriers, 40 warships, 175 aircraft, 21,000 personnel), but to prepare for the possible evacuation of Russian citizens. However, that may not be necessary. The Syrian army has so far successfully repelled the attacks of the disparate and ill-assorted opposition. Furthermore, the Syrian coast — from Cape Ibn Hani at Latakia to Jebla, Baniyas, and Tartus — is free of insurgents. By agreement with the lawful authorities in Damascus, debarkation operations can be carried out on "unequipped shoreline," as sailors say. Usually this is done as follows: large landing ships approach the coast at a distance of 100-150 meters (roughly 330-490 feet), open their nose flaps and lower ramps into the water for armored personnel carriers (APC) to roll out of the hull and, slowly but surely, "sail" to the shoreline, pouring fire from heavy machine guns at the "enemy" entrenched in the rocks. As soon as the APCs touch dry land, out jump marine assault troops who, under the cover of APC fire and naval artillery, draw up in a line and go on the offensive. At the time this article went to press, no such landing operations on the "unequipped" Syrian coast were imminent. One of the large amphibious ships in the interfleet group – the Baltic Fleet's Kaliningrad – passed through the Dardanelles, the Sea of Marmara, and the Bosphorus to the Russian port of Novorossiysk, to load up with air assault troops and BTR-80 APCs from which soldiers and officers will disembark. Another landing ship – the Alexandr Shabalin – is plying the same route across the Mediterranean Sea, and for the same purpose. In about a week, they are set to return to their previous anchorage point at the Syrian port of Tartus. Having fulfilled their "shuttle missions," they are scheduled to return to their home port of Baltiisk. Meanwhile, the Black Sea Fleet's Azov has returned to the Mediterranean, having picked up its troops and APCs. Sources in the general staff of the Russian armed forces say its destination is the port of Tartus. En route on Jan. 25, it is due to rendezvous with other vessels under the interfleet command, in order to conduct joint maneuvers. The Russian navy's logistics base at Tartus also received a visit from the Saratov. During its sea voyage, one of the diesel generators that produce electricity for the ship broke down, forcing it to dock for repairs. Whatever the exact circumstances, the Russian navy has established a “de facto” presence in the eastern and central parts of the Mediterranean, as well as the Horn of Africa, the Gulf of Aden, and the Red Sea. Although the objectives vary from region to region, this very fact suggests that times have changed. Russian vessels have stopped rusting on their mooring lines and have taken to the waves again, albeit not to intimidate anyone. The aim is to develop manpower, master the art of naval combat and navigation, fly the St. Andrew's flag (the Russian navy's ensign), and display readiness to form part of any international operation approved by the U.N. Security Council. In addition, if called upon, the goal is to protect the health and lives of Russian citizens, for which many could soon be grateful.